Synopsis: In a continent on the edge of war, two witches hold its fate in their hands. What I Thought: I have been dying to read this for awhile, desperate for a new book from Dennard since the end of her SSAD series - which I absolutely adored. I had extremely high hopes for this book, and I was pleasantly surprised. Safi is a Truthwitch, which isn't super excited compared to some of the other witches powers, however it is extremely rare and makes her wanted by all the different empires for her power. She's pretty and feisty, and a little bit selfish. Iesult is her Threadsister, a Theadwitch who is unsure of herself and her powers, but is brave and strong. Together, they end up on the run, meeting new and exciting people along the way. Dennard has created a beautifully vivid fantasy world with many different styles of witches. Her characters are layered with differing personalities and traits, each one continuing to surprise. However, book one felt like a very long introduction to the world and the characters, and seemed like a setup for the rest of the series. While there was plenty of action, and surprises, not much really happened over the course of the book. That being said, I'm super excited to see where the series is going to lead! The Good: I loved the fantasy world and the strong characters. The Bad: It was quite a slow first book - building up for the series. Hi Claire, Thank you for visiting my blog. 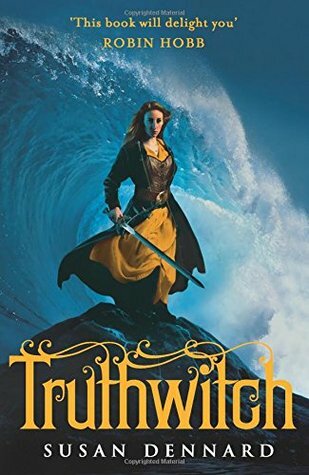 =) I ended up giving Truthwitch 3 out of 5. While I did enjoy the world building, unfortunately I didn't find Safi or Iseult to be remarkable. I prefer characters who are a bit more humble and selfless.